Aldosterone and other natural remedies for hearing loss may stop, and even reverse, this common age-related condition. It’s never too late to start using natural medicine to protect your hearing. 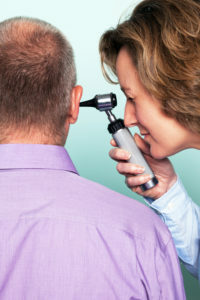 Age-related hearing loss affects 40% of Americans older than 75, and is becoming more prevalent as the population ages. Yet, researchers still don’t understand exactly why and how it happens, and effective treatments for it are lacking. People who are starting to lose their hearing are told to wait until it is bad enough that hearing aids are needed. By that time, the isolation, dependence, and frustration associated with hearing loss may already have diminished quality of life. Recently, however, a small number of integrative physicians have begun offering their patients natural remedies for hearing loss that may stop—or even partially reverse—this devastating condition. Bio-Identical Aldosterone: What Is It? A bio-identical version of the hormone aldosterone is increasing in popularity as an experimental treatment for age-related hearing loss and some other forms of hearing loss. In addition to regulating kidney function, aldosterone plays a role in controlling levels of two crucial signaling chemicals in the nervous system: potassium and sodium. The proportion of sodium and potassium is particularly important in the inner ear, where potassium-rich fluid plays a central role in converting sounds into signals that the nervous system recognizes. Aldosterone is currently available in both natural (bio-identical) and synthetic forms. Unfortunately, despite the encouraging preliminary research findings, the safety and efficacy of aldosterone for hearing loss have not been evaluated in humans. That hasn’t stopped some natural and integrative physicians from prescribing it, however, and reporting promising results. For instance, Dr. Jonathan Wright, MD, a leading physician in bioidentical hormone replacement therapy, is currently prescribing low doses of bioidentical aldosterone to patients with hearing loss who also have low baseline levels of aldosterone in their blood or urine. Dr. Wright and the other natural and integrative practitioners prescribing aldosterone must be very cautious, since excess aldosterone is associated with high blood pressure and increased risk of cardiovascular disease, among other side effects. Dr. Wright makes sure his patients’ aldosterone levels never get above the normal range, and he routinely checks their serum potassium, sodium, and chloride (electrolytes). Dr. Wright’s theory is that aldosterone is a natural steroid hormone that belongs in the body and isn’t harmful if it is kept within an acceptable physiologic range. This is the basic rationalization used by many prescribers of bioidentical hormones. Whether it’s true or not is not known and likely won’t be anytime soon, since there’s essentially no money to fund the large, long-term studies that would be needed to truly test this hypothesis. Nevertheless, aging adults with hearing loss are turning to practitioners like Dr. Wright who are prescribing bioidentical aldosterone. It’s never too late to start using natural medicine to protect your hearing. If you are experiencing diminished hearing with age, but are not yet ready or willing to go the aldosterone route, there are some other natural remedies you can try to at least slow down the rate of hearing loss. If you need to lose weight or get better control of your blood pressure or blood sugar, doing so may also help prevent further hearing loss. You’ll find a wide variety of articles and strategies by following the links above. If you’ve tried these, or any other natural remedies for hearing loss, tell us about them in the comments section below. This article was originally published in 2014. It is regularly updated. J Neuroimmunol. 2010 Dec 15;229(1-2):140-5. Am J Audiol. 2013 Sep 9. Jonathan Wright’s Nutrition and Healing. 2011 Aug 22. Accessed April 2, 2014. Jonathan Wright’s Nutrition and Healing. 2006 May 1. Accessed April 2, 2014. Geriatr Gerontol Int. 2014 Jan;14(1):40-53. Am J Clin Nutr. 2010 Aug;92(2):416-21. Ann Intern Med. 2007 Jan 2;146(1):1-9. Clin Otolaryngol Allied Sci. 2004 Jun;29(3):238-41.
aging, anti inflammatory, antioxidant, antioxidant nutrients, bioidentical aldosterone, bioidentical hormone replacement therapy, blood pressure, blood sugar, cardiovascular, cardiovascular disease, carnitine, ears, fish oil, folate, ginkgo biloba, health, hearing, hearing aids, hearing loss, high blood pressure, high blood pressure and, hormone, hormone replacement therapy, inflammation, inner ear, integrative, integrative physicians, kidney function, Lose Weight, melatonin, natural medicine, natural remedies, natural remedies for, natural remedies for hearing loss, nutrients, nutrition, oxidative stress, potassium, resveratrol, side effects, stress, sugar.